Often dismissed as an endless stretch of prairie lands of the Great Plains, the mid-western state of Nebraska will surprise. It offers dramatic rock formations in the panhandle area, towering sand dunes and gentle river valleys, while the Great Plains have a bewitching bleakness. Some of the best places to stay in Nebraska are in the state’s attractive small towns as well as its lively cities such as Omaha and Lincoln which offer a cultural edge. The Panhandle area, in particular, is fascinating. Huge bluffs of rock rise from the flat plains. Scotts Bluff, which towers 800 feet above the ground, was an important route-marker on the Oregon Trail, guiding the early travelling pioneers of the mid-19th century. Explore the visitor centre, then take one of several walks or drives and see if you can spot the original wagon ruts. Similarly, Chimney Rock, in a protected national site of the same name, is a striking 120ft spire that acted as a lighthouse for weary travellers. At the Agate Fossils National Monument, also in the Panhandle area, you’ll discover the bones of thousands of ancient dinosaurs who congregated here millions of years ago. To see examples of today’s wildlife, head to the Nebraska Nature and Visitor Centre near Grand Island, where the River Platte is home to 500,000 sandhill cranes (80% of the world population) and, during the spring migration, some 15 million waterfowl. A great museum that will entertain all the family is the Buffalo Bill Ranch State Historical Park, at North Platte, the home of Bill Cody, the father of rodeo and the famed Wild West Show. Of the cities, state capital Lincoln has the Museum of Nebraska History but possibly Omaha is more diverting. Here you’ll find the Union Pacific Railroad Museum, which tells the story of the world's most profitable railroad company; the Joslyn Art Museum with its collections of 19th and 20th century art plus sculpture garden; and the Durham Museum, which recounts the state’s pioneering past in the magnificent art-deco former Union Station train depot. Use our guide to the best places to stay in Nebraska to plan your trip. 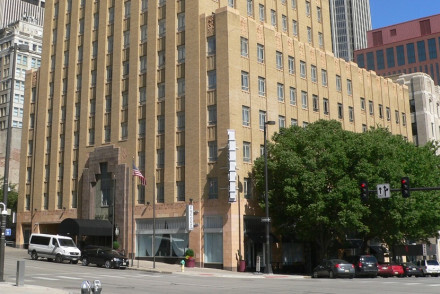 A gigantic, art-deco building that dominates downtown Omaha, the Hotel Deco XV offers sleek, uncluttered rooms in silky shades of white and grey with hardwood floors while the bar and restaurant offer shimmering, modern interpretations of art-deco design. Great cocktails in the bar and sophisticated classic food in the restaurant. For more choices, browse our list of the best places to stay in Nebraska, or contact a friendly guru for advice. A 14 story monolith rearing up out of downtown Omaha, this bastion of Nebraska Art Deco offers the ultimate in luxurious living, sleeping, dining and drinking. Interiors are sophisticated in sleek black & white with metal and wood accents. The soaring Encore Lounge serves cocktails and wines. Sights nearby - Orpheum Theatre is 2min walk, Henry Doorly Zoo is 7min drive, and Omaha Old Market District is 10min walk from the hotel.